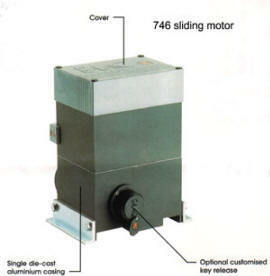 Securitex Electronic Systems Engineering/Autogate sliding FAAC 746. That is the guarantee of our special anti-crushing clutch that runs in an oil bath, combined with an intelligent electronic device that is able to detect the presence of an obstacle immediately, reversing with the gate when it's closing and stopping it when it's opening. The 746 motor and gear unit delivers smooth performance at any latitude and in every operating condition. 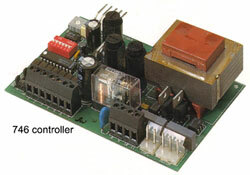 Power supply: 230 V - (+6% -10%) 50 (60) Hz. 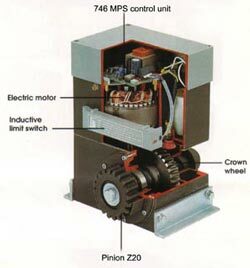 Electric motor: Single phase, bi-directional. Absorbed power: 300W. Current drawn: 1.5A. Thrust/traction force: 0-50daN. 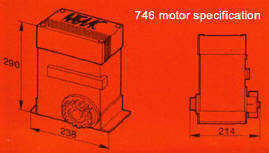 Motor speed: 1400 rpm. Motor winding thermal cutout: 120degree Celsius Clutch: two-disc, oil both Reduction ratio: 1:30 Ambient temperature range -20degree Celsius to +55degree Celsius. Weight with oil: 14 kg. Oil type: FAAC oil XD 220 Gate speed: 12 m/min. (Z20). Maximum gate weight 600 kg. Housing protection IP 55MT.